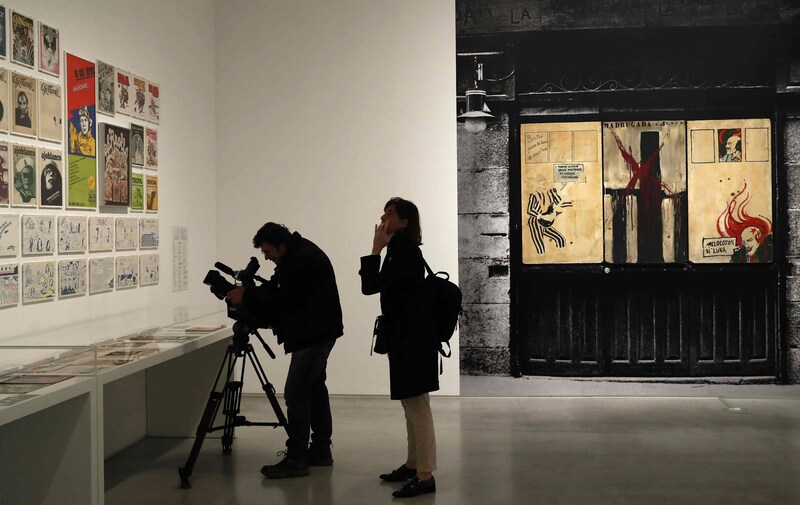 A groundbreaking exhibition about counter-culture during the Spanish transition to democracy previewed Monday at a contemporary art museum in Madrid. "The Poetics of Democracy: Images and Counter-Images from the Spanish Transition," stems from research led by the Reina Sofia Museum in Madrid and aimed to unearth the arts and artists that were ignored by the institutional official narrative of Spanish art in the 1970s. "With this exhibition," the curators of the exhibition said, "the museum is giving visibility to this research process — which was carried out over a decade — to recall a period when, alongside civil demands for democratic liberties, social justice, and self-government, there arose a new aesthetic linked to innovative cultural practices that sought to subvert the order of Franco's regime and the institutional schemes attempting to inherit it." The exhibition parts from an event that took place in 1976 at the Venice Biennale - also known as the Red Biennale - when organizers used the event as a platform to showcase art oppressed by Spain's former military dictator Francisco Franco as a way of reshaping the historical narrative of Spain's art scene since the regime took hold in 1936. In 1968, a year that saw global youth and art movements radically transform and reshape the world, counter-culture emerged in Spain as a parallel narrative to the official "story." A network of creatives across Madrid harnessed the momentum that started to gather into an organized movement through collectives, neighbors associations, alternative media - magazines, radio shows, graffiti - paving the way for the "Movida Madrileña," a cultural movement that started after Franco's death in 1975 marked by hedonism, the transgression of taboos, drugs and a prolific arts movement. The exhibition showcases images across various disciplines that bring Spain's counterculture of the 1970s out of the shadows and runs at the Reina Sofia from Dec. 5-Nov. 25.